A customer speaks to the holes in the thick barrier glass as he orders a beer in Philly stop-and-go shop. 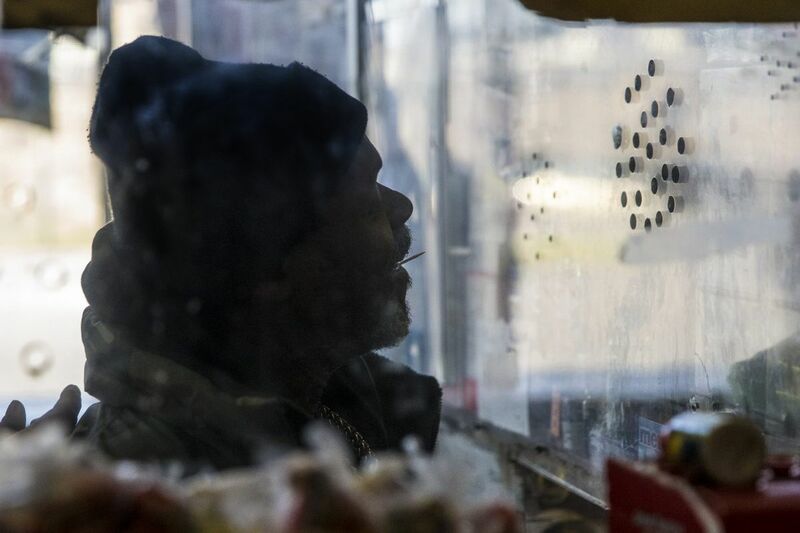 The Stop-n-Go business model has long been a scourge in Philadelphia's poorest communities. That's why it's so galling to see the owners of these nuisance businesses positioning themselves as victims in a battle over bulletproof glass. In reality, it is the patrons who need to be bulletproof, because these businesses, some of which are unlicensed to sell beer at all, are operating at the margins of the poorest neighborhoods in the poorest big city in America. They are appealing to the worst urges of the people who patronize them, and lowering the quality of life for those who live nearby. Councilwoman Cindy Bass has proposed legislation to help the city do what we've long sought — to shut down these nuisance establishments. I urge our Council representatives to support that legislation, because like any Philadelphian who has lived in the neighborhoods where these businesses thrive, I have seen what government negligence has allowed them to become. But my stories pale in comparison to the stories of others. In the past few days as I've delved into this issue on my radio show, I've heard from listeners who've experienced violence and gunplay in and around the Stop-n-Go establishments, and from politicians who've bemoaned their sale of crack pipes, Phillie Blunts and cough syrup that can be turned into drugs. But it was my assistant producer, 24-year-old Sakeenah Benjamin, who told the most harrowing tale. The year was 2004, and her cousin, Lamont Savage, was shot dead outside the Stop-n-Go at the corner of S. Dewey and Market Streets in West Philadelphia. Sakeenah was 10 years old at the time, and the incident weighed so heavily on her that she wrote a letter to then-Mayor John Street. "My name is Sakeenah Benjamin and I'm 10 years old," read the handwritten letter, penned in purple ink and billowing cursive script. "My cousin got shot to death at 32 years old on January 28, 2004. And I miss him a lot. Today someone got shot again. But I thank the lord that my cousin doesn't have to suffer anymore. Please Mayor John Street stop the violence because me, my mother, father, sister, niece and baby brother are so afraid that something might happen to us and our family." I asked Sakeenah if all the talk of Stop-n-Gos and the violence they breed brought back memories of her cousin's death. "Yeah it does," Sakeenah told me. "Because as we've been talking about it that's the only thing I can really think of because I have experience with it. The [Stop-n-Go stores] should be gone. They're bringing crime and violence into the communities and people lose their loved ones." Unfortunately they're not gone. And while then-Police Commissioner Sylvester Johnson paid a visit to her family to offer his condolences after Sakeenah's letter to the mayor, the store where her cousin was killed remains open, as do Stop-n-Go stores in poor neighborhoods throughout the city. They remain open, in part, because the enforcement of such establishments has been lax for decades. I spoke with Pennsylvania Liquor Control Board spokesperson Elizabeth Brassell, who told me that some of the establishments operate with no license at all, while others have not been adhering to the terms of the state-issued liquor licenses they've been granted. For example, some Stop-n-Go establishments operate under Restaurant licenses, which require seating for 30 or more people and 400 square feet of space. Restaurant license holders can sell beer, wine or liquor for customers to consume on the premises. They can also sell beer to go. Other Stop-n-Go establishments operate under Eating Place licenses, which require less space and seating for 30 people, but only allow customers to drink beer on the premises. Until this year, the Pennsylvania Liquor Control Board could only object to a license being renewed after its two-year cycle was completed. The licensee could appeal to Common Pleas Court, and without evidence of bad acts, such as murders taking place in or around the business, a judge could and often did overturn the objection. During the two-to-three year appeal process the business gets to keep operating. There were 99 objections filed in Philadelphia by the PLCB in 2016. Brassell couldn't tell me how many of those licenses were revoked because appeals are ongoing for many of them. The unit charged with ongoing enforcement is a unit of the Pennsylvania State Police called the Bureau of Liquor Control Enforcement. Calls to that unit were not returned by press time. The state has passed new legislation called Act 44. Starting in January, it gives the PLCB more powers to investigate and yank licenses from Stop-n-Go businesses. I spoke with state Sen. Anthony Williams, who along with suburban Republicans, helped to shepherd through the legislation. He believes it has potential to make the state board more effective. But Philadelphians are the ones who are living — and dying — in the neighborhoods where Stop-n-Go businesses thrive. With the new legislation from Councilwoman Bass, Philadelphia will have more power to shut them down. That legislation must be passed. Solomon Jones is the author of 10 books. Listen to him weekdays from 10 a.m. to noon on Praise 107.9 FM.